There are no tricks here… only treats for your taste buds! 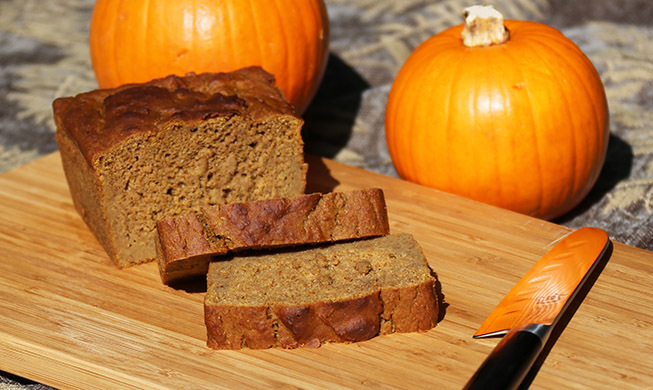 This yummy-ized pumpkin bread is so moist and rich with flavor that you will forget it is free of dairy and refined sugar. As we welcome Autumn, it’s time for our favorite pumpkin recipes. Pumpkins are rich in the antioxidant beta-carotene which might be a key in the prevention of cancer. They are also full of vitamin A, potassium, and dietary fiber. Have you ever baked with avocado oil? We experimented with it for this recipe and it worked wonderfully. The avocado is one of the healthiest fruits in the world and its oil is loaded with good fats and vitamin E. Experiment with it the next time a recipe calls for another kind of oil and let us know what you think! This photo is beautifully composed and the bread looks rich and delicious! Where do I find avocado oil? Can I sub coconut oil or will the flavor significantly change? Thanks Christine! You can find avocado oil at Whole Foods. I would substitute canola oil. If you modify it with another oil please let us know how it works!